Today's goal was to get words on the quilt. I met that goal and even surpassed it. That makes me happy! 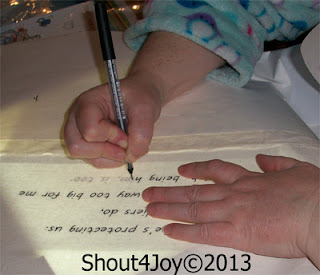 the letters onto the muslin. I hopped into the shower. I also put the name of the poem in the first border as well as the author's name :) It was a little bit harder to trace those letters as I couldn't see what I was doing. The letters were visible through the brown fabric, but I couldn't see the ink I was putting on the fabric. 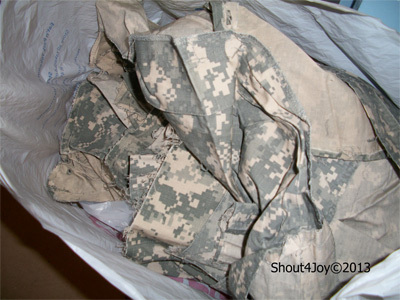 Out came the bag of ACU fabrics. The Army Guy breaks down his old uniforms when they get too worn out and gives me bags of these fabric pieces ... and I work on finding creative ways to use them ... and this is a perfect quilt to use some. 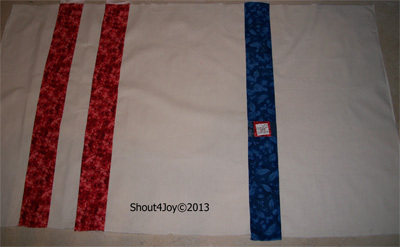 I trimmed up some pant legs to the right size and then sewed them to the sides of the quilt. This is where I ended up not so happy. I miscut two of the sides and they are a smidge too short, causing the center of the quilt to bulge *sigh* As long as the borders need to come off, I think I'm going to ditch the black corner blocks, they just seem like black holes in the corners of the quilt (and they just beg for a special quilting treatment and I am not sure I want to go there). Tomorrow's goal will be to fix the borders and then to applique the boots on the quilt. 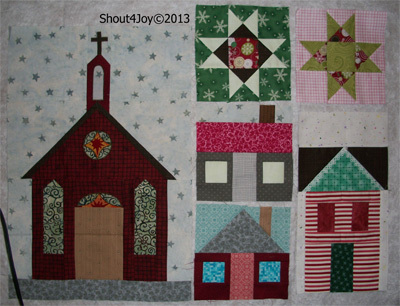 I'm getting excited about the quilt! It is starting to come together as I saw it in my head. 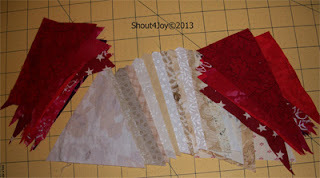 Now quilting designs are dancing in my imagination, lets hope they gel soon so I can apply them! 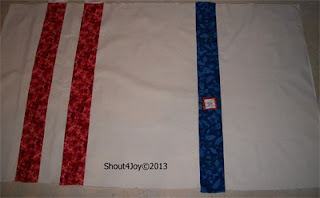 My quilt guild has a challenge for us ... and I've had an idea rattling around in my head for months. I've been gathering photos for inspiration, found just the right words to add, looked for the embellishments ... and procrastinated. 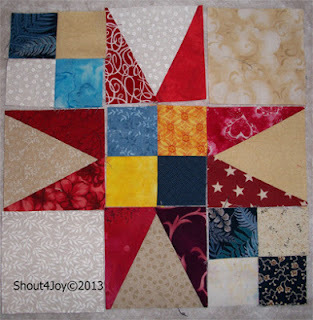 The challenge is to make a 35" square quilt with a minimum of 5 jewels on it. The theme is Shoes. I wanted to do Combat Boots. 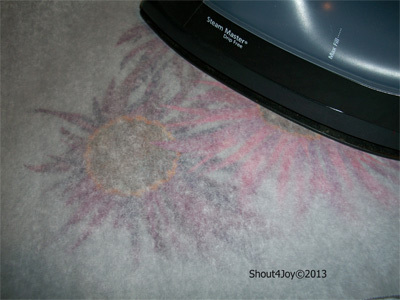 So I have took a picture and analyzed it for shadows and made the picture big :) Then I used the techniques from Vicki Pignatelli's Quilting Curves book to draw up my pattern. I didn't dig out the book, so I had to work from memory and thus did some backtracking a time or two. 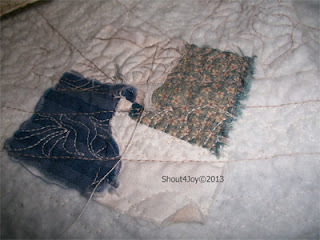 The "fun" part of this quilt was the lacing system. 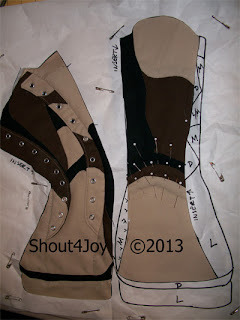 I was unable to find the right stuff to make authentic looking quick lace and eyelets. I had a choice of shiny gold or shiny silver eyelets. I chose the silver ones as they were less obnoxious than the gold ones. The longest part of getting these boots done was preparing the pieces for the eyelets. 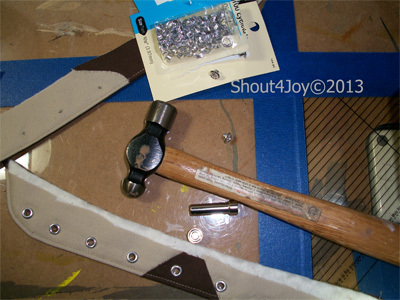 Cutting the tiny little holes for the eyelets to go through with little scissors was time consuming (is there an easier way? If so, let me know in the comments!). The second boot is in process. 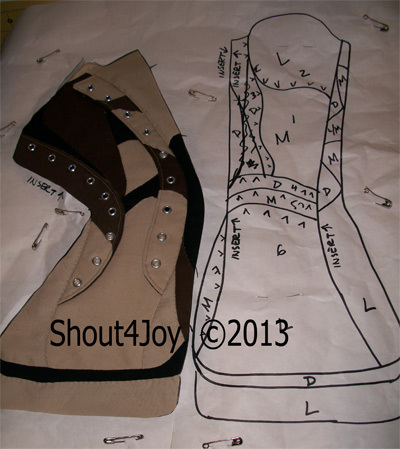 I use a lot of pins to hold those curves in place :) I don't want them to shift while I am sewing them! 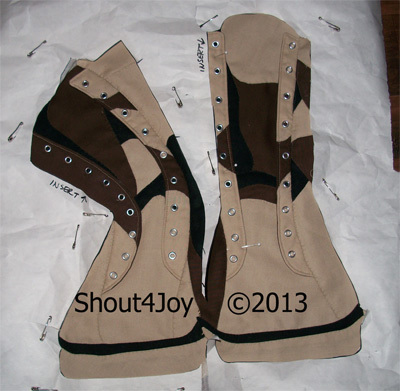 Here are the finished boots - well, there are some more things that need doing, but the basic boots are now finished. 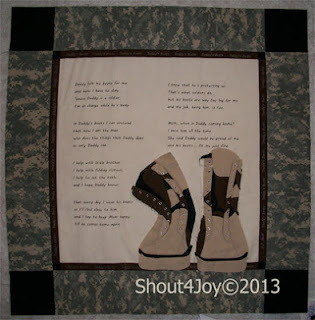 I will work on getting them ready to applique on the quilt and they will get laces after the quilt is quilted (authentic laces right from the Army Guy's old boots!). I'll try to remember to take more process photos as I work on other steps this week. This week on my Design Wall there are some more blocks from the Block of the Month I am doing with the Sewing/Quilting group in Jennings, MI. Last month was the church and this month we worked on three houses and two stars. The Townhouse block showed rick-rack in one of the views, so I pulled some lace to make gingerbread instead (I liked the lace a smidge better). 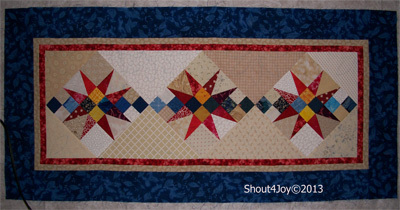 For even more Design Wall Inspiration check out Patchwork Times (one of my all-time favorite quilting blogs!). One of the things I did for this smaller project was to miter my corners. I wish I had done that on the larger project. When I finished quilting the top, I found that I had picked up a straggler - quilted right into the back is a leftover 4 patch from the Easy Street Mystery. 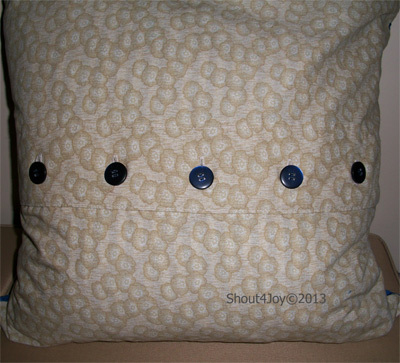 I am SO glad that this is a pillow cover and this oops will not be a design feature seen by many people! I'm so excited that there is a finish for this challenge!!!! 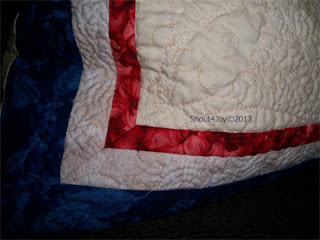 Project Quilting Challenge 4 quilt! Once I got the blocks on my design wall, I realized that three blocks were enough and I was happy to not include the sashing (more work and they didn't seem to add that much to the design). Yes, the blue border is WAY too big, but I like that. When the border is too wide, it gives me a lot of room for squaring up after quilting and blocking and before the binding goes on. 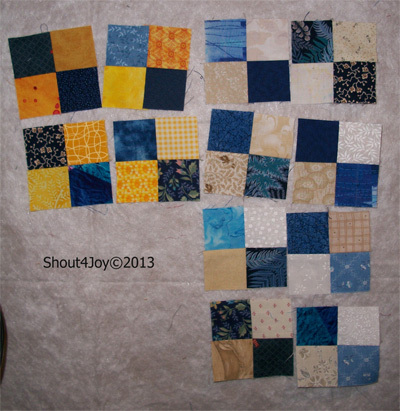 I have pieced a back :) As you can see, I have to square it up before I start quilting! 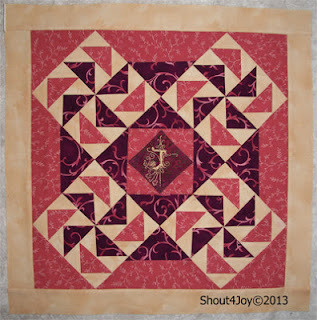 I'm working on Challenge 4 of Season 4 of Project Quilting; Wish Upon A Star. 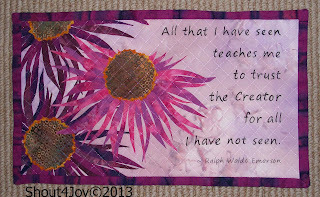 I had two different ideas running around in my head, one more traditional and the other an art quilt. Since the art quilt was going to be more involved and I knew I had to run children here and there this week, had a dentist appointment and hope to go sew on my BOM with the Jennings Community Church sewing group on Friday, I decided to go the traditional route. And after I got a good start, the snow picked up and cancelled the Drama activities for the children today, so I got to stay home and accomplish something on my project! I started off making a bunch of four patches - I know, they aren't stars, but they are part of my design. I have a few more to make to use in the setting of my blocks. Then I cut all the pieces for my triangle in a square units. This small quilt is going to be scrappy as I think it will hang on the wall in the same room as The Stars Sing and that is a scrappy quilt! 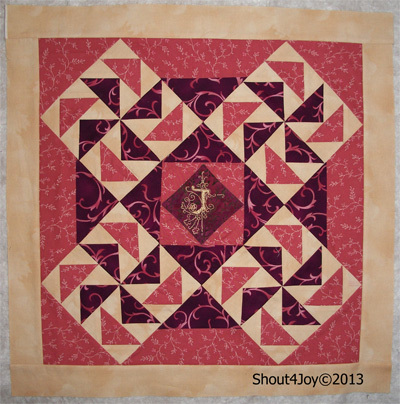 This piece is for Project Quilting Season 4, Challenge 3 - Annie's Vision. I started talking about my design process HERE and HERE. Today I completed the challenge by quilting and binding it. This was a huge accomplishment as I came down with an intestinal issue this week and have not been firing on all gears. 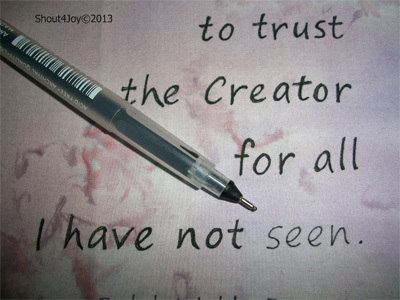 I've chosen a saying (I don't have them floating in my head, ready to use) and I've written it on my background fabric. Then the lines needed thickening as just one pass for the letters was way too wimpy when I laid the flower applique on to check the positioning. I'll be putting it all together over the next 30 hours (homeschool is taking a lot of time out of the next two days) and then deciding on how best to quilt it! 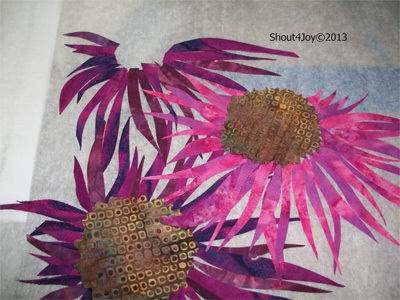 The challenge this week is make a quilt inspired by the artwork of Annie Young - check out her blog! 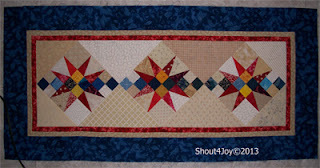 At first I was going to use Ricky Tims' Caveman Quilting techniques as they are freeform enough for my vision, but then decided to go the route of snippet style applique. I put some fusible web on the backs of the fabrics I chose for the petals and cut them up into petal shapes. NOTE: when using this technique remember to remove the paper backing BEFORE cutting all those little pieces!!!! Removing the paper backing from lots of those thin strips was NOT fun! Then I started layering the petals on parchment paper as I don't want to commit them to my background fabric quite yet. I want to make sure the words work first! 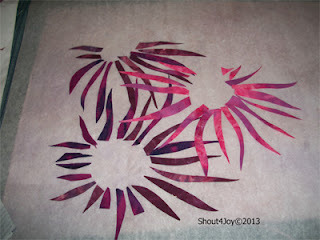 I continued to layer the petals as I made them way too thin and the big centers really dwarfed the wimpy petals! 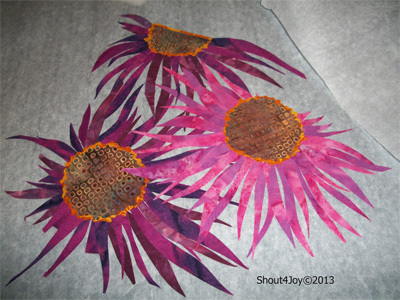 While I love the fabric I chose for the centers of the flowers, they were way too chunky and (in real life, not camera life) looked like black holes on my flowers. I had to come up with another solution. Now to work on a saying for this little quilt! I just didn't get much accomplished this week in the Sewing Dungeon. I don't enjoy having to go out to purchase obscure things for science experiments ... especially when the roads are a bit slick with snow/ice crud! 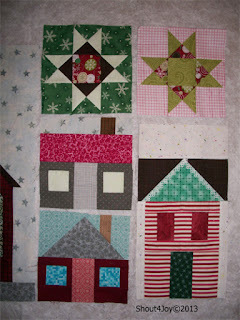 For some more design wall inspiration visit Patchwork Times! Guest Post today :) with a FQ bundle give-away! 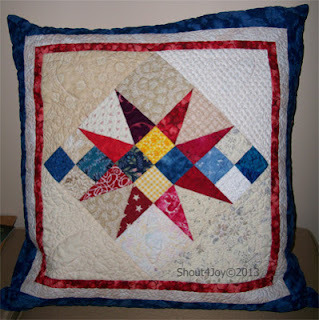 I personally love Project QUILTING because it has been extremely inspirational to me in my quilting journey. I know I only have a week for the projects but it’s a great opportunity to give ideas in my mind a try – see what happens, try new techniques. If it works…maybe I’ll do a bigger project that takes more time. Project QUILTING has me creating pieces I never imagined before, it brought me out of the only making ‘what I think will sell’ and in turn, and the Project QUILTING community has been such an inspiration and support. I have heard from many that they love watching along with Project QUILTING and the projects created from the challenges but they just can’t fit making a quilt in just one week. 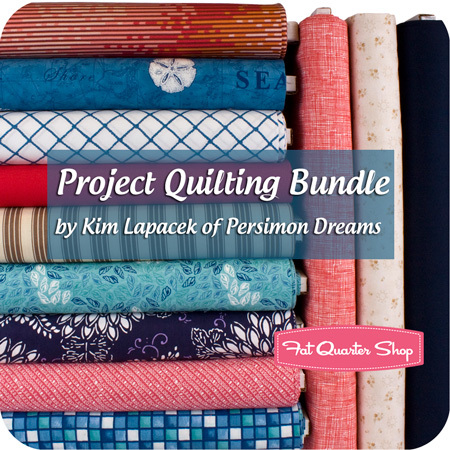 That’s what my exciting news is all about today – a new *Bonus* Project QUILTING Challenge. 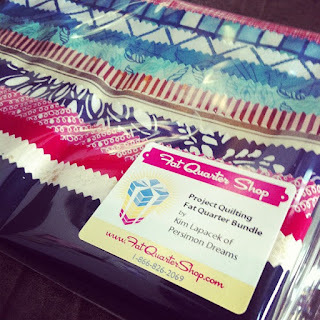 I’ve teamed up with a fabulous online fabric store – The Fat Quarter Shop to bring you all the ‘FatQuarter Shop Bundle Challenge – Tradition Times Three’. Diane outlines what is required for this particular challenge. You must go to the FatQuarter Shop to buy the fabric bundle in order to complete the challenge BUT the twist is – you have until May 30th, 2013 to submit your challenge! At that point, one of my girls will randomly draw a winner of $75 to use at the Fat Quarter Shop. 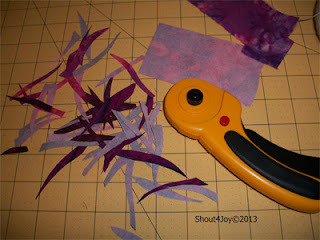 I also wanted to share with you a few ways you can save on your fabric bundle. First – head over to my blog and enter in the giveaway I posted today. 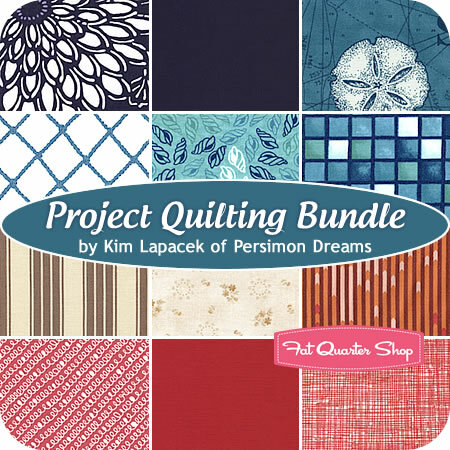 OR if you want to save 20% off your entire purchase of fabric from the Fat Quarter Shop check out this blog post to find the special code – good through February 10th. 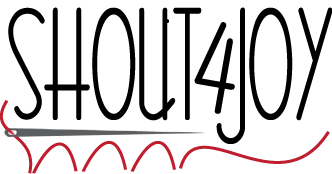 Thanks for having me and I hope to see you all with a quilt in one or more Project QUILTING Challenges. Have a great rest of your week!